guided imagery, self-hypnosis and relaxation music. 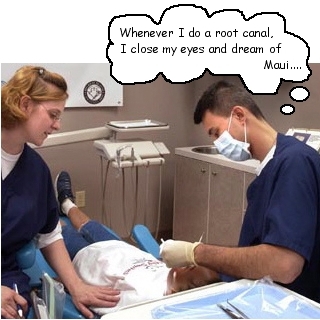 There is also a discussion of the limitations of relaxation for overcoming dental fears. Breathe in through the nose to a count of 4, hold your breath to a count of 4 , and exhale to a count of 8. Inhale slowly through your nose by pushing your stomach out. Once you’ve inhaled as much air as you comfortably can, just stop. You’re finished with that inhale. Everybody has different size lungs and counts at a different rate. Pause for whatever time feels comfortable, then breathe out slowly. If you have smaller lungs and you find 4-4-8 too long, try breathing in for 3, holding, and breathing out for 5 (this technique can also be used with children). You can also search for deep breathing apps on the App Store or Google Play. If you have an Apple Watch, you can use the built-in Breathe app to practice controlled breathing, or for Android Wear use BreatheWell. Progressive muscle relaxation works by isolating one muscle group, making the muscles go tense for 8-10 seconds, and then letting the muscle relax and the tension go. This technique doesn’t work so well in the dental context, because it takes quite a long time until you’ve gone through all the different muscle groups! However, it can be really helpful to master this technique at home, because it helps you become aware of tense muscles and you may then be able to use this knowledge to detect and relax tense areas of your body. When we are anxious or when we anticipate pain, we tense our muscles (with many people literally “gripping the chair”!). Making an active effort to consciously relax your muscles can really help. Concentrate on finding areas of tension in your body and relaxing them, one after the other. Common areas of tension when in the dental chair may include your hands (you may want to place them loosely on your belly – that way, you can check that you’re breathing through your belly at the same time), the shoulders, the back, or indeed your whole body. Visualisation is a great way of reducing stress… it helps you to relax!! All joking aside, guided imagery and self-hypnosis can be useful both during dental visits and in the run-up to your visit. Guided imagery brings you to a relaxing place, such as a beach, a garden or a meadow, evokes the sights, sounds, smells and sensations you may experience in this place, and creates a safe and secure environment in your mind. Nowadays, there are lots of apps available. Guided imagery/meditation/self-hypnosis apps are a very personal thing as their effectiveness is very much dependent on whether you like the speaker’s voice or the background music. It is best to “try before you buy” if possible. You may also prefer relaxation tracks which contain music only, for example Zen, Spa, Yoga or Meditation music. Many people find that relaxation does help (as part of a package which includes a kind and competent dentist), but there’s no need to beat yourself up over it if it doesn’t do much for you. Given how easy it is to learn basic breathing techniques, it’s always worth giving it a try though, and may come in handy in other situations! The information on this page has been provided by Dental Fear Central. Last reviewed on November 20, 2018. We welcome your feedback on our information resources.